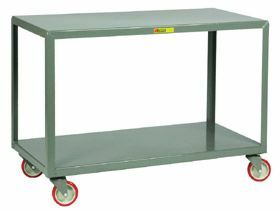 Two-shelf table is perfect for stock room, assembly operations, maintenance, etc. Durably built to handle 1000 lb. loads. All welded steel construction delivers years of dependable service with no assembly. 24" shelf clearance. Rolls smoothly on non-marking 5" polyurethane casters. FOB Shipping Point. Product No. Size W x L x H Wt. (lbs.) Price Ea.